The RT81 turntable is Fluance’s response to an exploding demographic of casual audiophiles that we’ve witnessed since the recent resurrection of vinyl in mainstream culture. A wicked player that puts sound quality over flare, the RT81 gives you a very fair-priced bang for your buck. And in this review, we’re going to dive deep into what makes the Fluance RT81 special. 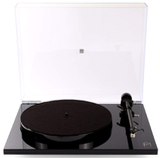 We’ll discuss the turntable’s build quality, materials, easy of use and sound. 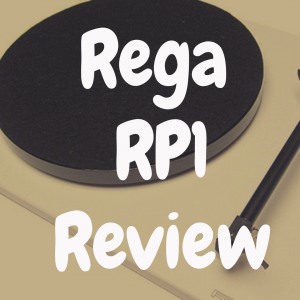 We’ll also take time to compare the RT81 against its predecessor, the RT80, as well as the Audio-Technica AT-LP120. Primarily known for their speaker systems, the RT81 is Fluance’s second foray into the turntable market. 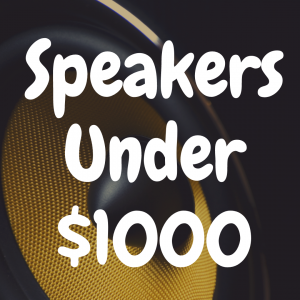 The machine was clearly developed to economically deliver superb sound quality. It’s predecessor, the RT80, was a valiant effort that unfortunately fell short as far as comparable hardware at the price point, but it did lay firm groundwork for the RT81’s success. A quick start guide, plus standard lifetime customer support and a two-year manufacturer’s warranty. At only $50 more, the RT81 outshines and outperforms its forbearer. The RT80 can be picked up for $199.99, and while it will scratch your analog itch, it lacks some of the finesse and potential durability of the newer model. 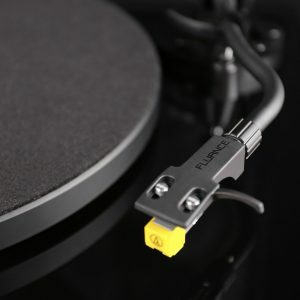 The biggest advantage of Fluance’s newer turntable is the improved stylus. The RT81 replaced its predecessor’s AT91 conical diamond needle with the AT95E elliptical stylus dual magnet cartridge.The elliptical finish on the diamond stylus allows for the needle to sit lower in the groove and trace it better, compared to the spherical tip of the RT80’s conical; meaning less wear on the record and a more crisp sound quality. The next huge step up is the body construction, the RT81 features a solid wood body made from audio grade MDF. Aesthetically the walnut finish gives off a more modern feel than the RT80’s piano black.The solid wood construction and rubber slip mat minimize the machine’s vibration while it’s turning, ensuring that the low-end is able to come through clearly while spinning things like hip hop or bass-driven rock albums. Finally, the cherry on top, Fluance upgraded the platter slip mat from felt to rubber. Both players use the same balanced aluminum S-type tone arm and aluminum platter. Each one has switchable phono preamps built in for use without a stereo receiver. Both models have the same RPM control knob that let’s users switch easily from 33 to 45 to off. And both use Texas Instruments preamps with gold-plated RCA line outputs. What does all this mean? 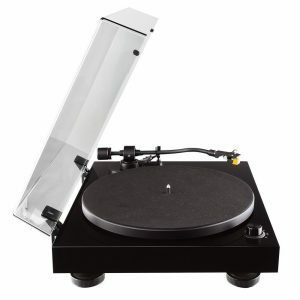 Why do you care if your turntable has an elliptical or conical tipped needle, or what the slip mat is made out of? 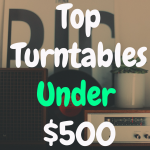 All of these features add up to create a turntable that is sonically optimal for the price range, and also plays gently and respects the condition of your records. The RT81 is not without its flaws. However, the only real qualms one can have would be easily quelled in moving up a price point. For example, while the manufacture boasts that the belt-drive is one of its premium features, it could still be improved by having a solid-state drive. Again, this decision was most likely made with price in mind. Also, the simple 33/45/off switch is undoubtedly user friendly but its plastic composition cheapens the feel of the machine. There’s also no speed or pitch adjustment fine-tuning. Lastly, the “Auto Stop” feature could be better. 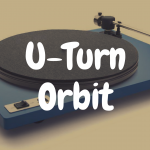 Aimed at making sure the turntable and needle don’t spin unnecessarily, use of the feature simply stops rotation when the needle reaches its final grooved, and prevents rotation when the tone arm is not positioned over the platter. Though the Fluance turntable user manual warns: “The Auto Stop function will take approximately 30 seconds at the end of the record before the turntable stops spinning. 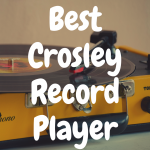 Due to variances in vinyl record production some records may not work correctly with the Auto Stop function.” If it’s not going to work for all records, then what’s the point? The Auto Stop function should really be upgraded to or replaced with an auto return tone arm feature. Once again, Fluance did what they could while staying within the parameters of the price range. The RT81’s various features aim to preserve the life expectancy of both player and record, while combatting the downfalls of its cons. The needle and auto stop feature are specifically designed to save the grooves from unnecessary friction. 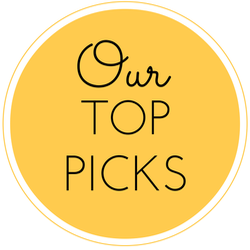 And the solid wood construction and quality hardware components add to the machine’s life. Unfortunately, if your record doesn’t fit the mold, so to speak, the Auto Stop can become your worst nightmare. And the belt-driven turntable is more susceptible to suffering from pitch variance, as the belt converting rotation from the drive motor to the platter can loosen over time or excessive use. Nonetheless, the RT81 stands up well against most other models from the $200 to even $500 range. Providing superior quality than even some Rega, Pro-Ject and Pioneer models. That being said, dropping some more cash to acquire the Audio Technica AT-LP120 could potentially be worth looking into. So, why don’t we jump right to it? 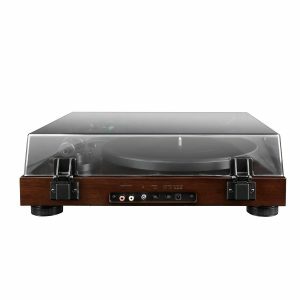 The LP120 does not have the humble simplicity of the Fluance, but certainly the practical capabilities anyone could ask for. 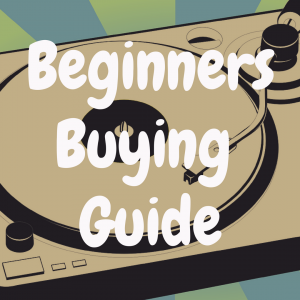 For $300, you can own a DJ grade machine. Direct drive motor, allows for more control of torque and typically lasts longer than the belt-driven assemblies. USB port that allows you to play through your computer or convert your records to MP3. Auto return hydraulic tone arm. 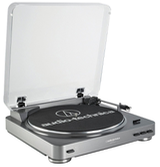 Plus the Audio Technica turntable has a stroboscopic platter with speed indicator. Forward and reverse operation with variable pitch control and speed lock, and a popup stylus target light for ultimate accuracy. The aluminum platter and tone arm remain consistent. Both turntables come with an Audio Technica AT95E cartridge. And the both have built in switchable pre-amp for use without a receiver. The Flaunce RT81 is a phenomenal player that has been received well by the masses both critically and individually. The sound quality it delivers for the price you pay is far beyond anything else at this price point. However, if you’re looking to a turntable with flash and customization, this one isn’t for you. The RT81 is a simplistic style player that emphasizes sonic quality and affordability, great for record collectors of all shapes and sizes. 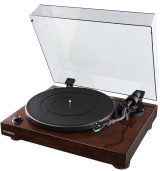 3.6 stars out of 5, because for the money, this is more than a capable record player for most people’s needs.